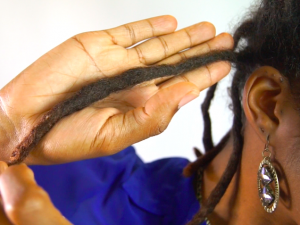 If you’ve ever noticed an area of your locs that has become rectangular in shape and wondered, “how did this happen?” or “what causes flat locs?” you are in the right place. 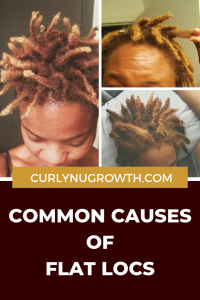 In this article, I will briefly share with you a few of the most common causes of flatness with cultivated locs and answer a common question— “can flat locs be made round“. Please Note: If you are completely growing your locs with the freeform method, this article may not be useful because flat locs will be a natural occurrence for you. Typically, when you are growing locs the desire is for the locs to become round in shape and relatively smooth along the surface. 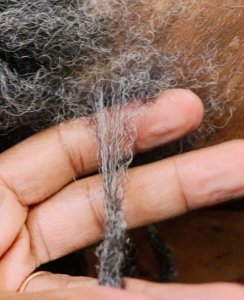 However, as your locs are maturing you may notice that instead of the typical cylindrical shaped locs you now have flat locs or areas that are flat along the shaft. The common causes of flat locs include air drying, the amount of time between grooming, and/or poor foundations. I know we all hate sitting under the dryer, especially as your locs get longer and the drying time increases, however dryer time is crucial to preventing flat locs. 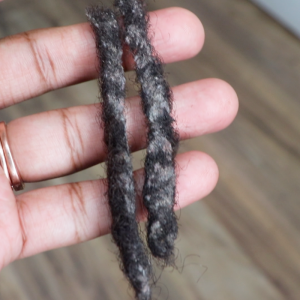 In addition to the not so obvious issues with air drying your locs, if your locs are not fully dry and you lay on them (i.e. go to bed with wet hair) your locs will dry while being compressed. Anytime that your locs dry in a compressed state you risk the result of flat locs. Waiting for an extended period of time without cultivating (i.e. shaping the locs) may result in some of the locs growing out flattened. Unfortunately, many people begin to semi-freeform their locs at the wrong time or for the wrong reasons and issues such as flat locs occur. This is especially true for longer, more mature locs due to the weight of the hair on the ends elongating the roots as your hair dries. We know there are several ways that you can part your hair to start locs, however if you choose to make your parts using a more rectangular shape, you’re more likely to develop flat locs. A rectangular shape at the roots is more prone to becoming flat because that is the way your hair will naturally want to tangle. This also applies if you combine your locs and the base would result in a rectangular shape (think two square parts together become a rectangle). 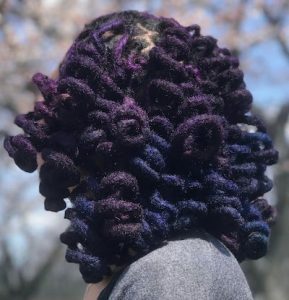 Can You Round Out Flat Locs? Whether or not you can transform flat locs to rounded locs will depend on how long the locs have been flat and your hair texture. If you have had flat locs for years, or even months, the chances of them completely becoming round in shape greatly diminishes. The reason for this is because your hair has already settled and formed an internal structure based on the current shape. If or when you try to disrupt this process and attempt to round your locs, they will not comply willingly. Also, coarser textures of hair are also more resistant to changing shape. Ideally, to round out flat locs you will need to catch the issue very early on and use a micro-crochet hook to get the job done. What has been your experience with flat locs?